frank and jacob, the older brothers of anna and celia, rocking here in a souvenir picture of some kind, illustrate the notion that sartorial know-how and snappy dressing run in the family. 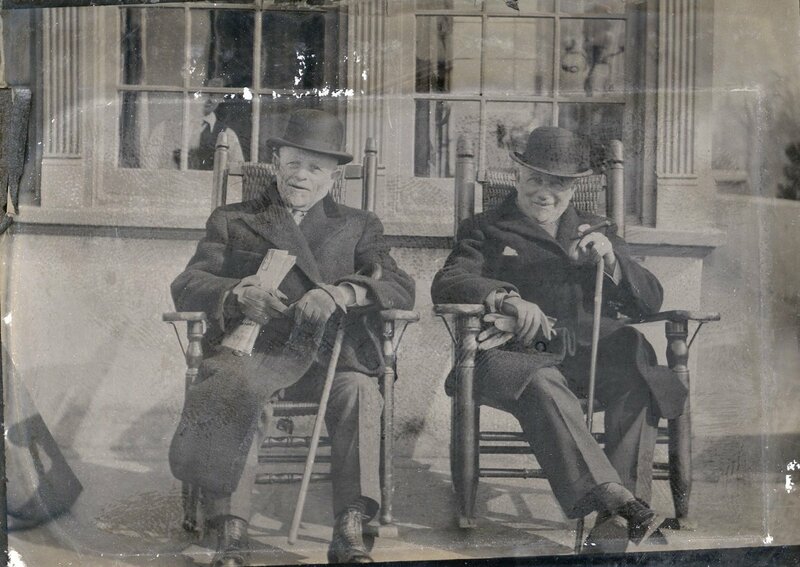 though jacob (the younger brother, on the right) was relatively well-off in his career as a real estate man, frank, my great-great-grandfather, did not find the same prosperity as a tailor and presumably was not always able to dress quite this well. his children sacrificed education to get out into the world and work to help support the family — my great-grandfather was a telegraph boy, his brother william won money as a prize-fighter, sister sophie worked as a milliner. however, when frank’s sons grew up and became successful, they helped to support him — something that they would have been doing at the time this picture was taken. my grandfather, son of the above telegraph boy, remembers quite well frank’s always dapper figure walking down the streets of newark, reading a different section of the forward at each newsstand and candy shop along his route, so that by the time he arrived back home, he’d read the whole paper for free — a thrifty streak that i see traces of every time my sister and i get excited over the clearance racks at macy’s. Those faces are so kind and funny….like two bit characters in The Music Man or State Fair. I see poppy’s humor in them….and the fact that they are sitting outside, essentially sunning themselves, reminds me of him as well. I like the newspaper trick. THAT reminds me of myself at frozen yogurt places or restaurants, where I essentially can try every flavor or soup and not pay one cent. i hadn’t thought about the sunning themselves – that’s actually pretty awesome. i think they’re just adorable and probably pretty funny. i bet they told good stories, too.and yeah, i bet they’d ask for samples of soups too.